Sometimes, going into the shoe store to find your perfect fit isn’t possible. Silvert’s offers online ordering with a 45 day return policy so you get the perfect footwear for your foot. Online shopping can be fun but also dangerous. If you don’t read enough about the product you could end up with something you don’t want. So be sure to read about the Silvert’s shoe that you are about to buy. There also presents the problem of variety between shoe brands. This guide is to help try and get you the proper footwear the first time. If you are purchasing for someone else, be sure you talk to them about any feet problems they may have, as well as keep in mind their mobility. Often when people are mainly concerned about width they don’t take into account other factors that could cause foot problems. Having proper heel and arch support also plays a very big part in having a comfortable shoe. Silvert’s creates shoes that have insoles with arch support and heel support, so that these factors can always be included in proper footwear. Every shoe has a slightly raised heel for support and stability when walking. Every slipper has cushioning to make a comfortable shoe. Looking at the bottom of an old shoe for a size can be the wrong move for two reasons. The first reason is this shoe has been warped. You may not be able to see the size period depending on how worn it is. An old pair of shoes will have been more than worn in. 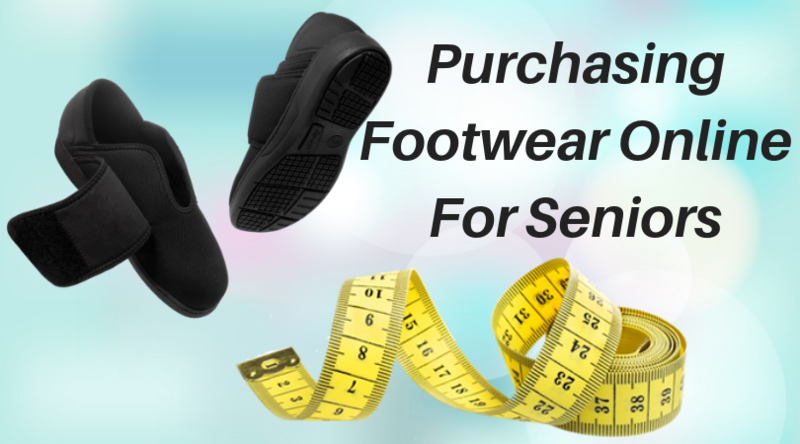 They are a good measurement of what to keep in mind when purchasing your next shoe. Look at the shoe from heel to toe. If you see any holes, look to where they are. If you notice they are on the top of the foot, a hammertoe could have done this; therefore the next shoe should have a more flexible material on the top, or simply a deeper toe box to avoid blistering on the toes. If you notice a hole on the side, check for bunions. Old shoes will have been worn down to make them more comfortable. Getting new shoes on old feet can be harmful to the feet if they are the same as shoes that didn’t work until worn in. The other reason could be that this was not the right fit for them in the first place, a large percentage of people wear improper sizes to accommodate for a foot difference, such a wide feet. Take a tape measure and measure the length of their foot as well as the circumference. If you are struggling to find a tape measure, a piece of rope or string can almost work better sometimes. This can help to compare against size charts. Some other areas to check on the foot are where you see wider widths. If you see swelling around the ankle area this could mean you need a shoe with a lower ankle, so as to allow for natural swelling. If you notice that there is the most swelling near the front of the foot you will want to look for shoes that have more stretch near the front of the shoe. Listening as well as looking is important. If you notice they complain about a certain area, it could shed light on what is needed for their feet. Their foot needs to be comfortable from heel to toe. Feet are a hard thing to fit due to any pressure points that the foot may have. Every foot is different, so having one shoe to fit them all is near impossible. In elderly feet swelling is one of the main issues to arise. Foot swelling can happen for a matter of reasons at any age. It can be a dietary problem; too much salt can create swelling in the feet. Swelling also occurs naturally from being on your feet and walking around all day. However consequently, if you are simply standing or sitting all day, swelling will also occur. If you are in one position for too long there is less blood flow through the body, which in turn will cause feet and areas far away from the heart to swell. Swelling can also be caused by other problems such as Edema or Lymphodema. These conditions are harder to find shoes for, in most cases you have to accommodate for extreme swelling. Having flexible materials is always a good attribute to look for these conditions. Looking for materials such a neoprene will allow the shoe to stretch to allow for swelling as the day goes on. Hook and loop fastenings also allow to adjust your shoe to fit at any point in the day easily and quickly. Other foot problems that could affect which shoe you purchase could be hammertoes, bunions and bone deformities. These are very important to pay attention to because often these are the types of problems that will caused foot pain if there is too much pressure on them. This could be a shoe not having a deep enough toe box to fit the hammertoe. Or it could be that the shoe is pressing against the bunion. Having shoes with a stretchable material can create a more comfortable shoe. Silvert’s does not offer half sizes. This can prove to be difficult if you know that you’ve been a size eight all your life. As a rule of thumb, Silvert’s shoes are often wide to extra wide in width. This extra width tends to make the shoe very generous. In other words, this shoe tends to fit big. So keep that in mind; if you are trying to decide between a seven and an eight, a seven might be the better option. Going up in size can also prove to be dangerous. Most people think that one or two sizes bigger will help with the width, but in turn this can prove to cause slips and falls. Having shoes that are too long for your foot will make you trip over them, regardless of if they fit your foot width wise. It is better to look for a separate, wider shoe with more adjustability instead of settling for one that is too long. Elderly are more susceptible to falls, having footwear that isn’t right for them will only increase the chances. Silvert’s provides wide and extra wide shoes to help any swelling or any abnormality that will cause the foot to be wider. Silvert’s also has “hook and loop” closures on our shoes and slippers. Silvert’s adaptive clothing & footwear has a customer service that is available to you from 9am to 5pm, Monday to Friday and Saturdays from 10am to 4pm Eastern Time. At Silvert’s there are specialists who will be able to talk you through which shoe is the best choice for any foot. Gauging how long a foot it and the width of the shoe will be easier to work through with them, because they can physically check each pair of shoes. They are able to see the footwear first hand to tell you how flexible the material is. These specialists will know all about depths and widths. In certain cases you will get the question of if you are able to draw or trace out the foot on a piece of paper and send it to them. This is so they can print it off and physically put it in the pair of shoes in question to see if it will fit accurately. So if they ask for a measurement, be sure to give them a correct outline of the foot. Make sure to give them the proper circumference so they can make sure that the shoe will fit both vertically as well as horizontally. They will also be able to direct you to which shoe would work best for each foot problem or abnormality. This guide was made to help increase your confidence in purchasing the right pair of shoes. It’s understandable that you or your loved one can’t always get out to a store. So having as much help as you can get is important to hopefully get the right size on the first try. It’s important to get not only the right size but the right fit for each giving foot. Silvert’s wants you to be comfortable in your footwear, whether it is indoors or outdoors. We offer a large variety of high quality slippers as well as high quality shoes. All of our footwear has cushioning, to keep you comfortable. Silvert’s strives to help you to be able to continue like normal, regardless of your foot condition.